For most of those who know what they need in terms of performance and features, a set of monitors in the $500 range offers the best value for the money. Some of the absolute best monitors on the market currently can be found here as well. With that said, those extra features mean another layer of things to research when making a choice. In order to help you get through this with the least amount of frustration, we’ve found the best monitor speakers under $500 you can get right now. Let’s take a closer look and see what we have. It isn’t often that we find a studio monitors which go outside of the standard framework of design. Despite some brands taking a bit more freedom than others when it comes to aesthetics, nothing really comes close to what Edifier did with their S2000 Pro series. Needless to say, aesthetics are a big part of what S2000 Pro are all about. Looks aside, you are looking at a great setup consisting of 5.5″ low frequency driver paired with a rather powerful tweeter. Power wise, these are pretty good all things considered. Where Edifier took a turn was when they added Bluetooth support as well as optical and coax inputs in the I/O cluster. If you’re looking for something a bit different, look no further. KRK Rokit series are known for their performance, cost efficient design and overall value for the money. Rokit 6 monitors deserve a special place of their own. What we have here is the third generation of these speakers which build upon the previous version while adding some new features. For the most part, KRK went on to iron out whatever quirks previous gen had. With a bi-amped setup pushing the massive low frequency driver as well as the pin point accurate tweeter, you just know that transparency is what Rokit 6 is all about. In addition to that, we have front firing horizontal ports as well as a rather extensive room acoustics control cluster in the back. Overall, KRK Rokit 6 Gen 3 is a package you can trust. If you are familiar with JBL as a brand, you probably know that their speakers are among the best in the world. It is simple as that. 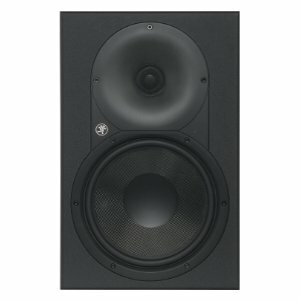 However, what most people don’t know is that JBL makes some mean studio monitors as well. Case in point, JBL LSR308. LSR308 are the bigger sibling of the LSR305, which have proven to be magnificent in the field. With LSR308, you are looking at a similar performance only scaled up in all ways imaginable. We are talking 8″ low frequency drivers, massive yet carefully designed waveguides as well as plenty of power. JBL offers these with XLR connections as well as TRS ones, all kinds of acoustic controls which includes HF and LF trims and more. In short, LSR308 professional grade. 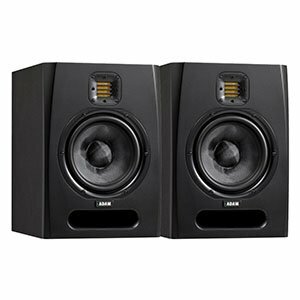 Yamaha’s HS series have quickly become among the most popular studio monitors in whatever category they appeared in. That is quite an accomplishment considering how saturated the market is and was back then. HS8 is the largest offering in this series but arguably the best one. You are getting the best of both world, including massive low end combined with razor sharp highs. As expected, the overall design of the speaker hasn’t really changed at all. They just went on and scaled everything to fit the new hardware. In other words, you get that same subtle cabinet which features some of the best materials in this category, as well as the great waveguide for the tweeter. With 120 Watts of power, there’s plenty of headroom to work with. 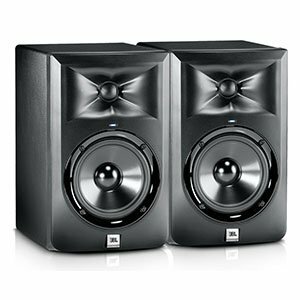 Even though Mackie is known for a variety of affordable monitors, they have proven more than once that they are capable of competing in the upper mid range segment. One model that fits this description is the XR824. This bad boy packs an amazing combination of hardware at a price which is still considered competitive. On top of that, XR824 features a great looking cab. Mackie went with an 8″ Kevlar woven low frequency driver which easily pushes massive amounts of air with great precision. Higher frequencies are left to the 1″ low mass tweeter sitting inside a carefully designed waveguide. In terms of power, you are looking at a massive 160 Watts delivered by a proper Class D amplifier. That explains the 36Hz to 22kHz frequency range. 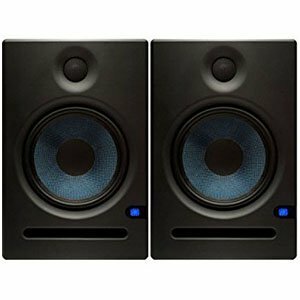 PreSonus Eris series are among the most trusted monitors spanning from the high budget segment to mid range segment. PreSonus Eris E8 represents one of the largest members of the family and translates that familiar performance into a much broader range of frequencies. PreSonus hasn’t changed much with this model, which is probably for the best. You could say that they’ve just scaled everything up. Transducer complement includes a massive 8″ Kevlar low frequency driver paired with a 1″ low mass silk dome tweeter. On top of that, PreSonus has included a front firing bass reflex port which does wonders to tighten up the lower end and reduce issues caused by placing the speakers too close to a wall. With great acoustic controls and 130 Watts rating, these look promising. Compared to most of their direct competitors, Adam Audio F7 are quite unique. Not only are we looking at a pair of monitors made by one of the best names in the business, but Adam has also chosen to implement some of their high end solutions into what is essentially a mid range set of monitors. None of this is apparent until you look closer. Lower end is taken care of by a set of extremely tight 7″ low frequency drivers. Aside from their nominal performance which is great to say the least, there’s also a large front firing bass reflex slit port to push that performance even further. Tweeters come in form of hybrid ribbon design found on higher end Adam Audio models. And that is just the beginning. What Can A $500 Set Of Monitors Do For You? Compared to more affordable speakers belonging to the $300 range, the stuff you can get for only $200 more is significantly better all around. We can divide these improvements into three distinct categories. First one is going to be raw performance, then we have the built-in features, and finally the design. You are guaranteed to see improvements in all three of these categories. We are going to start with raw performance to kick things off. With a budget of $500, manufacturers are often going to include a decent set of transducers. You are going to see a lot of Kevlar woofers, which are soft but rigid enough to give you good response even in lower ends of the range. Similar goes for tweeters. Both transducers are going to be fast movers which translate to high definition and high sensitivity. On top of that, you will see a lot more professionally engineered waveguides, which also has a positive impact on the overall performance. 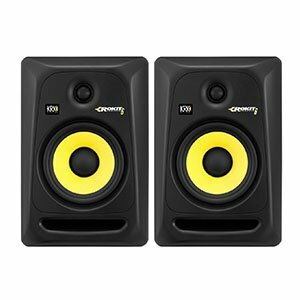 Monitors in this price range will give you the taste of what the high end, $1000 monitor speakers have to offer. It is also important to mention that power outputs are going to usually be above 100 Watts per speaker. The large majority of models we are looking at here will feature a bi-amped Class A/B setup that powers each speaker individually, reducing chances of conflict between them. One of the more important aspects of getting the transparency necessary for music production is to set up the speakers in relation to the room you are using. Every speaker in the $500 price range will have some sort of acoustic control on the back panel. Without these, all that improved performance would go to waste. The range of these controls varies from model to model. Lastly, we have the design of the cabinets. If you’ve been looking into cheaper speakers, chances are you will notice the lack of flashy designs and colors. 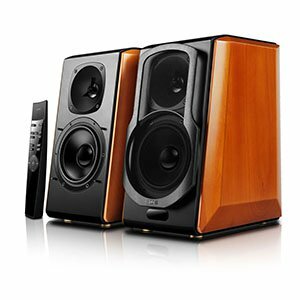 Speakers found in the $500 segment of the market are often going to be pretty simple in appearance. However, their design is focused almost entirely on performance. Where Do $500 Monitors Fit In The Grand Scheme Of Things? Once you get out of the lower mid-range segment of the market and enter the upper mid-range, you might start to wonder where these monitors fit in. Are they still meant for enthusiasts and beginners or are they more on the advanced user, professional side of things? 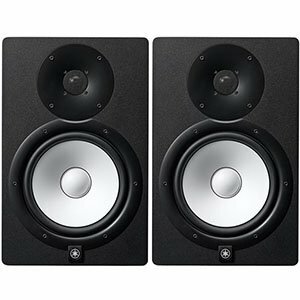 There is one interesting thing about studio monitors in general. Pros tend to use whatever they find to work for their particular studio. In other words, some producers may spend thousands upon thousands on their monitoring speakers, but others might find a model like the ones on our list and be fully content with the performance. What we are trying to say is that you shouldn’t really worry about who uses $500 monitors. Instead, find a pair that best fits your personal style and performance requirements and stick to it. The truth is that you won’t really be able to gauge how good a monitor is until you put it through the paces of your own studio and your own mixes. As most of you probably know, transparency is one of the most important metrics by which any set of monitor speakers is measured. Without transparency you are basically left with a not so impressive set of standard bookshelf speakers. How do $500 monitors fit into this whole story? When you start investing into more professional monitors, you will find that they pack a much more refined performance. For starters, the marketed frequency range is going to be wider and more importantly accurate. One quick glance on our top list above reveals that most of the monitors we have chosen for this guide feature a larger low frequency driver. Contrary to popular belief, a larger LF driver isn’t there to add bass in the conventional sense of the word. Instead, the main benefit of larger drivers is the wider lower end which they are capable of delivering. You are still getting a transparent sound, but you are now able to hear those lower frequencies much better and see how they fit into the mix. When you go past the core features and hardware, there is a secondary world of monitor speaker components which can significantly alter the performance of said speaker. In the context of our discussion today, those features come in form of precision engineered waveguides and different transducer designs. Waveguides are important, that much is a fact. However, not all of them are created equal. A good waveguide will improve tweeter performance and impact how sound waves propagate from the speakers. On a similar note, having something like a ribbon transducer can introduce that edge you were looking for all along. Ribbons are much more responsive which makes them a great tool to have when you are mixing music. Are they necessary? Probably not, but a good ribbon transducer can definitely open up new possibilities for the average producer. Investing in a $500 monitor speaker is a sound decision that will definitely benefit you down the line. The models we have shown you today are by far some of the best you can get at the moment. Interestingly enough, all of these have been around for a while, living to see several updates along the way. What is more important is that we have access to a very satisfactory level of performance at a price that is acceptable a large percentage of the user base. With that said, we definitely hope you have found something that works for you.